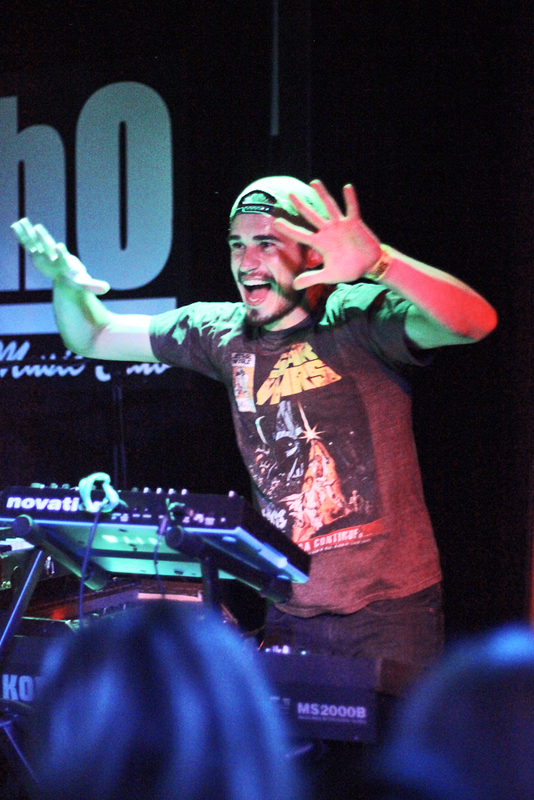 FMLYBND, Isla Vista’s next big musical act, brought their indie-electronic vibes to SOhO Restaurant and Music Club on Friday, Feb. 21, courtesy of We The Beat. Touring their recently released EP “Gold,” the six-piece band performed a stellar show to a sold-out crowd, alongside local artists Shoes Pretty and Givers & Takers. Live electronic artist Shoes Pretty set the mood with his ambient electro-pop sounds. As SOhO was slowly filling up, his glitchy beats and synthesized vocals combined to provide a chill atmosphere. The obscure sounds of repetitive hi-hats, backing drums, upbeat keyboard, and electronically warped vocals were evocative of Baths, or an experimental and R&B influenced Postal Service. Next, the “eclectic-psychedelic” rock band Givers & Takers gave a fun and funky performance. The soulful voice of lead singer Zack Greenwald ranged from falsetto to grunge, getting the crowd to sway, bob, and bounce around. Just like the varying vocals, the music altered from heavy and distorted lo-fi noises to slow and melodic rock to groovy jazz-reggae. The band is wrapping up their first full-length album, “Let Me Have It,” to be released this year. With all on vocals, the band is composed of Drew Bruchs (bass), Greenwald (lead vocals, guitar, keyboard, tambourine), Alan Krespan (drums), and Mark Pollack (guitar, MIDI). The band members’ great musicianship and close-knit chemistry were evident in their hour-long rock-out performance. “It was a great crowd. Everyone was dancing, everyone was energetic, and having a good time,” said Bruchs. By the time FMLYBND got on stage, the dance floor of SOhO was packed. The once busy bar was now relatively empty, and groups of friends and couples crowded to the front. FMLYBND is truly a family–only without any vowels. The band consists of IV natives Mac Montgomery (lead guitar, vocals), Braelyn Montgomery (vocals), Al “GoldenBear” Valles (guitar), Ethan Davis (drums, sampling), Justin Huntsman (drum machine, bass), and Erik Mason (synthesizers). Davis is also half of the bass-heavy DJ duo Candyland. “FMLYBND are having a lot of fun… There’s no ‘too cool’ vibe, and that’s nice,” said 25-year-old Westmont College graduate Jake Blair. The band was full of hair flips, laughs, and smiles. Huntsman jokingly told the crowd that Braelyn was his wife, to which Mac replied, “She’s mine!” Mac and Braelyn Montgomery have been married since 2011. “I wanna see everybody moving,” said Mac. “I wanna see this whole place moving.” FMLYBND closed the night out with their vivacious dance song “Come Alive.” And with that, pretty much all of SOhO was on their feet, from couples spinning one another around and friends frolicking about. As the song reverberated to an end, drummer Davis hoisted himself up the ceiling pillar for a last hoorah. FMLYBND is performing at the upcoming Austin X Games in June, headlining with the likes of Kanye West, Flaming Lips, Pretty Lights, Dillon Francis, Candyland, Slightly Stoopid, Mac Miller, Dillon Francis, Mayer Hawthorne, Wavves, and Bad Religion.